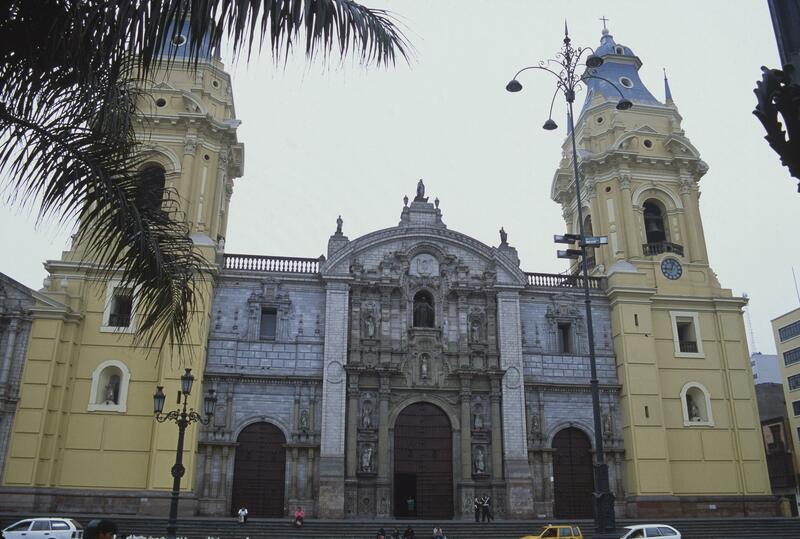 Like many other cathedrals in both Spanish America and worldwide, Lima’s was built and re-built over centuries. The result is a building that, in its stylistic diversity, captures shifts in tastes and styles as Limeños sought to express, in architectural terms, the importance of both their city and the Church. The lower part of the façade was created in the 17th century. The upper part, finished in 1722, is notably more complex and ornate. The whole ensemble is crowned with an unusual arched and unbroken pediment. along the main doorway, saints are set in niches, a typical features of church façades. The tops of the towers were late additions to the building. While earlier churches existed on this spot, this one was mostly designed by a leading architect, called to Lima by the viceroy to take up this important commission. Born and trained in Spain, Francisco Becerra would come to the New World and be awarded commissions in Puebla and Quito before arriving in Lima. While his design, with its wide footprint still predominates, the exterior façade is the work of several different, later, designers. The building is largely made of stone. The interior vaults may have originally been brick. But after the devastating earthquake of 1746, its builders used wood for vaulting and sheathed it with quincha, or reeds covered with plaster, a material used widely in the Andes. 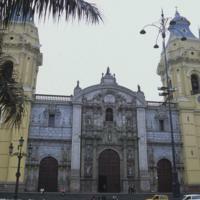 Francisco Pizarro, the conquistador of Peru, founded Lima’s cathedral was founded on this site in the 16th century. He is buried within. Pizarro also established the main square it faces, the Plaza de Armas (“Plaza of Weapons,” i.e. a military parade ground), thereby setting the twin projects of evangelization and conquest into the urban fabric itself. Lima was the center of Spanish political power in the Viceroyalty of Peru. Its cathedral was likewise the flagship of the Church there. The many patrons of its construction were thus motivated by civic as well as religious concerns. Ballesteros, J. Bernales. 1972. Lima: La ciudad y sus monumentos. Seville: Escuela de Estudios Hispano-Americanos de la Universidad de Sevilla.